I have recently bought my first home- a 1976 contemporary. I want my first project to be the kitchen, but on a tight budget my only option is to paint… I am having a hard time picking out paint colors. They are currently black and white but it feels too stark and cold. I want to keep a mid century mod motif- I was thinking grays and browns to match the brick red colored tiles on the floor, but I would love some ideas. 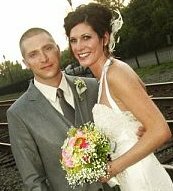 My husband and I are first time home buyers in the Albany, NY area. Relatively speaking, it did not take us too long to find our dream house- a 1970’s contemporary. I knew before we even began looking for a house that I would not buy a “cookie cutter” house. 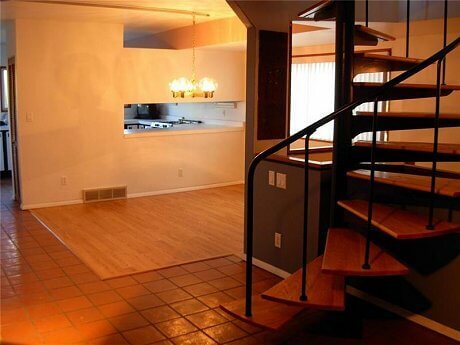 When we walked in to this house, we fell in love with the spiral staircase and the retro feel of the house. The layout is a bit awkward- the main living space (kitchen, dining, and family room) are in the walkout “basement”. The main floor is a wide open living room- the third floor holds the bedrooms and there is even a fourth floor loft area (accessible via ladder). I am very excited to add even more midcentury mod touches to this house! We are closing on the house Wednesday and will begin our renovations this weekend. Okay, readers… What do you think? 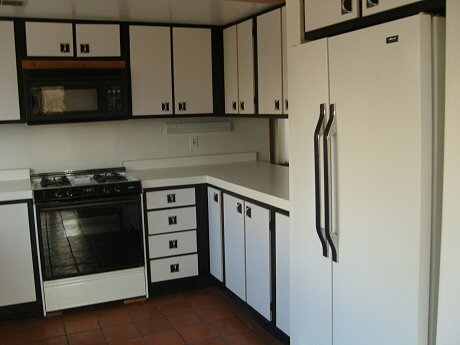 Note, Veronica confirmed with me that she is considering repainting both her original laminate cabinets and/or the walls. I already have some ideas, and draft post prepared, but let’s hear your thoughts first — then I’ll do a follow up post tomorrow. I think a sunny yellow would look great. 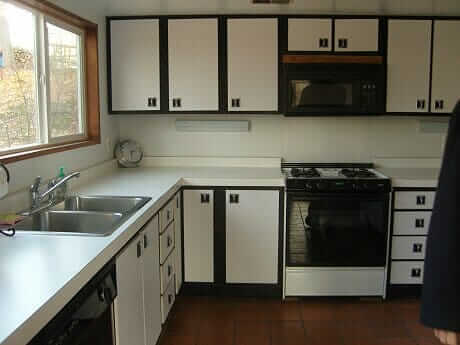 Black and white and yellow look good together and yellow was a popular kitchen color in the 70s. Hope you let us know how it turned out! The cabinets look like they have blue on them, if so I’d repeat that on the walls and go with a wild rug incorporating the blue. If they are in fact black/white, I’d go with a very mod looking black/white wallpaper and in both I’d do mod hanging round lights. Tulip chair/table would complete the look. 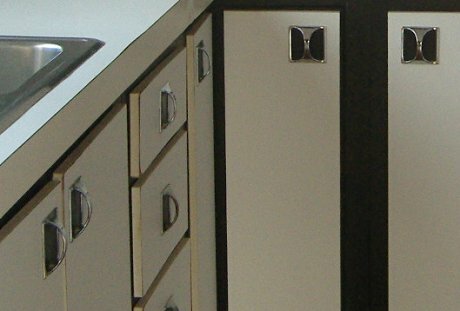 Nobody would have stencilled a kitchen cabinet until the 1980s, ours looked exactly like yours.